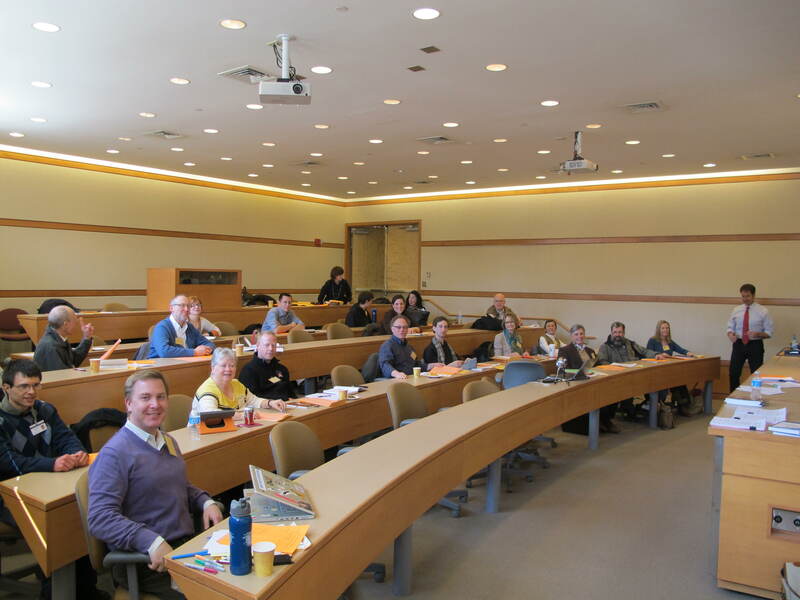 update: 3/28/13: audio of part 2 of the workshop, on Latin hexameters, is now posted below. 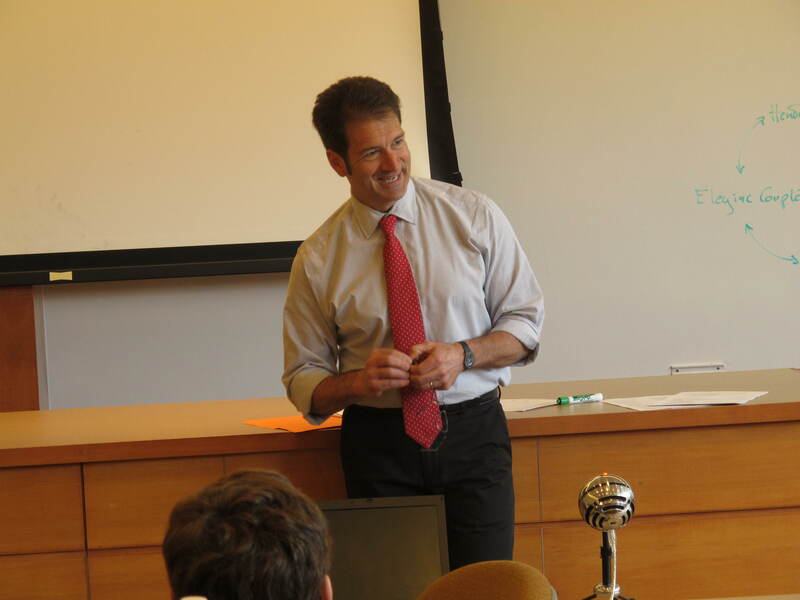 Andrew Becker came to Dickinson for a full day workshop on Latin metrics this weekend, and it was a delight. 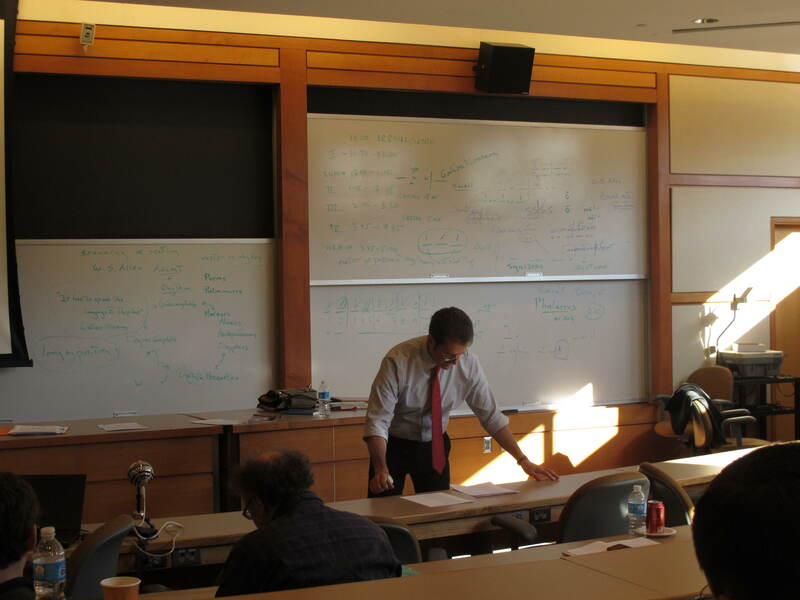 His presentation was overflowing with the love of poetry, deep knowledge of the Latin grammarians, and best of all, lots of common sense in what is too often a contentious and captious area of scholarship. Here’s a little taste, a section near the beginning where he argues for scanning lines orally, not on the page, and for the idea that word accent is primary, but that ictus still makes itself felt as an undercurrent. Scanning, i.e. reading aloud with an exaggerated ictus, is not wrong, he said, but just a preliminary step towards the actual performance of the verse, with the correct word accents. Here is a longer selection from the first session on scanning vs. reading, among other things. I’ll post more as I get it edited. What is your favorite classical commentary? What place did it have in your intellectual development? Recently I asked the members of the DCC editorial board to write for the blog about these questions. Here is the response of Meghan Reedy, Assistant Professor of Classical Studies at Dickinson College. Her current research is on emotional display in Roman poetry, particularly in the moody love poems of Propertius. I have a real fondness for David Mankin’s Green & Yellow commentary on the Epodes of Horace. As an undergraduate I loved Kenneth Quinn’s commentary on Catullus. It seemed to hold out the allure of Things Rare and Obscure, and I remember feeling drawn to its tiny fatness, and its densely printed pages—but it was in using Mankin’s Epodes as a graduate student that I came to appreciate something else: namely that an understanding of Rare and Obscure Things is a common goal, and not a trophy. The first thing I learned from Mankin was that special, cool things need not be beyond comprehension, chilly or impersonal. A work in any genre of academic writing can give the impression, accidentally or on purpose, that it has been received from a higher plane of super-human erudition, rather than written by an insightful person. But the risk of giving such a false impression is especially high in a commentary. A commentator writing for students tends, for good reason, not to develop ideas at much length—which also means that there is not much opportunity to convey a sense of personality, of a distinctive point of view. The reader, on the other hand, tends to go to a commentary precisely for such succinct explanations, looking for aid in an encounter with the Real Author at hand, Horace or Livy or whoever, and not looking for an encounter with some commentator. But it happens anyway. Even with so little to go on, even without meaning to, one invariably trusts or distrusts a commentator, feels a kinship or a distance, ease or frustration. And with Mankin for the first time I felt a kinship. I had the sense as I worked through his Epodes that we were sharing an aim, and I appreciated his candor about what he thought Horace was up to and what struck him as difficult to interpret. It was a revelation to me that this was at all possible. Which of course led to a knock-on revelation: I realized that commentaries could be controversial. If commentators were actually people, their work was thus something other people were entitled to form real opinions about, to engage with and turn over in the mind. Marvelous to consider, I found that I too had opinions, and could attempt to solve riddles. Who would have thought a commentator, a mere commentator, could have such an effect? Who knew that commentators mattered in this way? But they do. 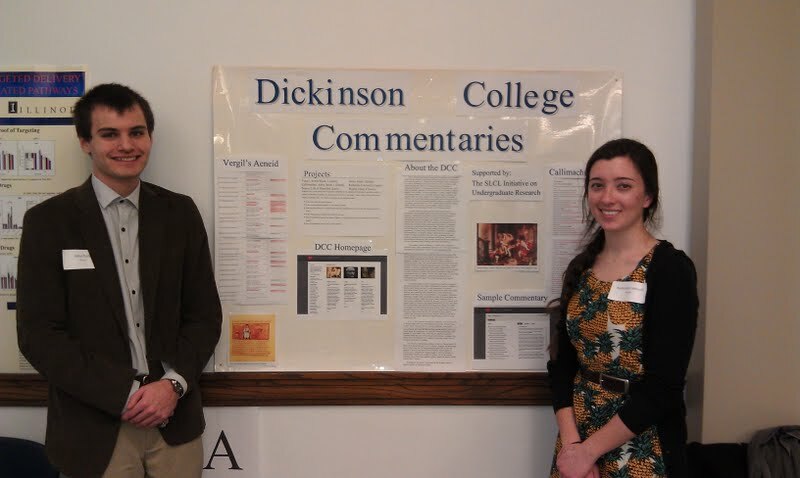 This spring, with generous support from the School of Literatures, Cultures, and Linguistics at the University of Illinois Urbana-Champaign, three UIUC students have been contributing to the Dickinson College Commentaries project. Pictured here are James Stark and Katherine Cantwell at a poster session last Friday, as they presented their work, which is being carried out under the supervision of Professor Arian Traill, a member of the editorial board. James has done outstanding work creating complete vocabulary lists for the selections of Vergil’s Aeneid covered in the College Board’s AP Latin course, aligning those lists with the DCC core vocabulary in a way that will greatly ease the creation of a future DCC edition. This Vergil edition will eventually form a companion to the existing editionof the AP Caesar selections. Katherine has been working on the edition of Callimachus’ Aetia by Prof. Stephens of Stanford, making the existing content conform to the format and goals of the DCC. In both cases, the key activity is working on the vocabulary lists that accompany the (untranslated) Greek or Latin text. These lists are hand-designed and human-edited, not computer-generated. The expertise of the student in making these lists correct and properly targeted to the intended readership is a major part of what makes DCC distinctive and useful. Wes Heap (not pictured) has been working with Prof. Mulligan of Haverford on his forthcoming DCC edition of Cornelius Nepos’ Life of Hannibal. I would like to extend a big thank you to James, Katherine, and Wes for all their work, and to Prof. Traill for applying for the grant that is funding it, and for her expert supervision. What is your favorite classical commentary? What place did it have in your intellectual development? Recently I asked the members of the DCC editorial board to write for the blog about these questions. Here is the response of James Morwood, of Wadham College, Oxford, author of many books, including the A Latin Grammar, The Oxford Grammar of Classical Greek, and most recently The Oxford Latin Course, College edition (Oxford University Press, 2012). My favourite commentary is R. Deryck Williams’ Aeneid, which dates from 1973 and is now published by the Bristol Classical Press. I think that the main reason that I love it is that it is the work of a man who himself loved Virgil both wisely and well. This love shines on every page. It is a deeply civilized edition, constantly slipping into quotations from English poetry which set the Aeneid in its place near the font of European literature. It is odd that, as reception gains a more and more firm foothold, editors have become increasingly uptight about including literary parallels from the Renaissance and later in their texts. Williams read the Aeneid once a year – each time, he used to say, wondering whether Aeneas would bring himself to abandon Dido – and his understanding of the poem as a whole informs the edition throughout. Of course, it is a work marked by its seventies vintage. It advances the “two voices” view of the poem that we identify with Harvard, and up to a point it tells us what to think. In fact, the two voices approach seems to have weathered well; and even if my own feeling is that editors should present the evidence objectively, giving their own view but not trying too overtly to influence their readers into accepting it, the passage of time has meant that we can regard Williams’ obiter dicta with a questioning sense of detachment. The thoughtful student of any age has nothing to fear and everything to gain from immersion in these pages. It is not difficult to patronize Williams, as indeed Nicholas Horsfall has done. He wrote too much about this poet and was liable to repetition; his views could later slip into the banal. But he was a good scholar who lived and breathed Virgil, and that has made his edition an inspirational vade mecum for the Aeneid. All of the introductory material and explanatory notes accompanying the text of Sallust in this edition are written in clear and elegant Latin. Moreover, on every page there is a Latin paraphrase of Sallust’s text, which really amounts to a translation of Sallust’s works into a different Latin. This well-written paraphrase/translation admirably fills out the sense of some of Sallust’s more compressed and elliptical phrases. The Latin footnotes (which are written in a very simple style) not only explain grammatical peculiarities and harder constructions, but also provide historical and biographical explanations to clarify Sallust’s text. While all participants in my Sallust course benefited in many ways from the seventeenth century edition, we all, of course, felt the need to use supplementary material now and then. Historical and cultural information, and some of the textual notes, required updating in light of recent scholarship. Nevertheless, I came away with huge respect for this seventeenth-century edition as a superb pedagogical instrument – which provides all sorts of necessary help, but keeps the reader always in the target language. The students using this edition had many times the exposure to Latin constructions and vocabulary than they would have had, if they were using a recent edition in which the text of Sallust is explained by copious notes in English. 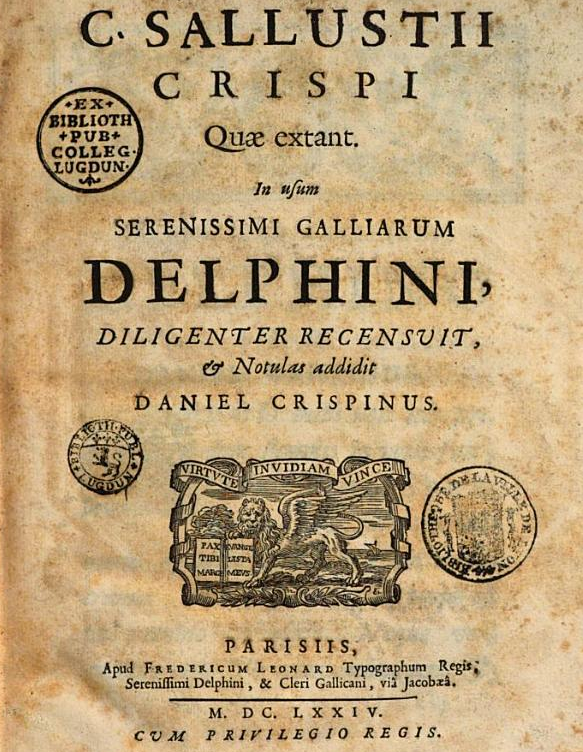 The late seventeenth-century editions of classical texts (both Greek and Latin) printed in Paris, and entitled in/ad usum Delphini, were indeed “for the use of the Dauphin,” namely for the son of the king of France. But the phrase in usum Delphini also appears in later editions which had no connection with the royal house of France. Jean Clouet, “The Dauphin François, Son of François I.” First half of the 16th c., oil on panel. Royal Museum of Fine Arts, Antwerp. In such editions this phrase in usum Delphini simply indicates the edition is designed for the younger readers in general, who are still getting used to the reading of the unadapted texts of ancient writers. Such, for example, were the classical texts printed in London in aedibus Valpianis during the early nineteenth century. These British editions also feature detailed explanatory notes written in simple Latin, but these notes are often swollen to such size that there is often room for only a tiny amount of original text on each page. Moreover, by comparison with the 1674 edition of Sallust described above, the Latin paraphrase of the classical author’s text was often vestigial or non-existent. So, my hat is off to those who produced the original editions in usum Delphini. Images:Google Books and Wikimedia Commons.